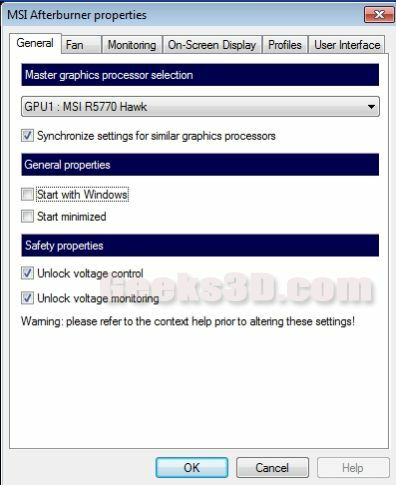 MSI’s R5770 Hawk is a factory overclocked graphics card: the GPU (Juniper) is clocked at 875MHz (reference board = 850MHz) while the memory keeps the reference clock (1200MHz). 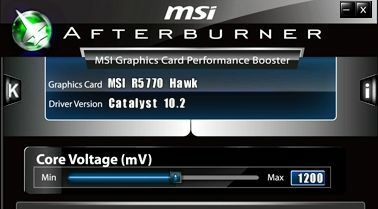 R5770 Hawk official page with complete description and specifications can be found HERE. 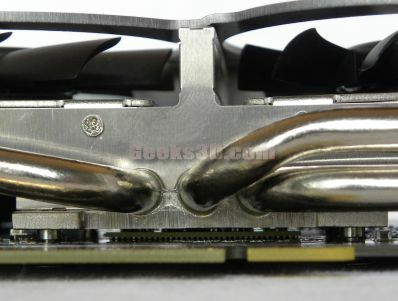 MSI has done a very good job on the VGA cooler part. 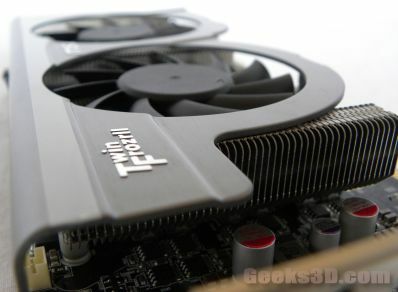 The Twin Frozr II is able to chill the GPU very efficiently with an extremely low noise even under heavy load! My ears are very sensitive and even a Zalman VF1000 VGA cooler is too noisy for me. But I can work without any problem near the R5770 Hawk. Nice job! 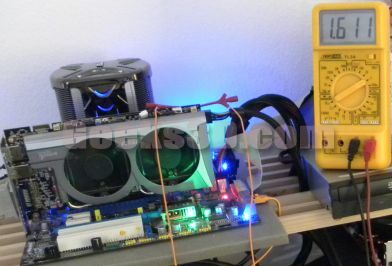 Okay, let’s see what a multimeter says when it’s connected to the GPU v-check point of the R5770 Hawk. 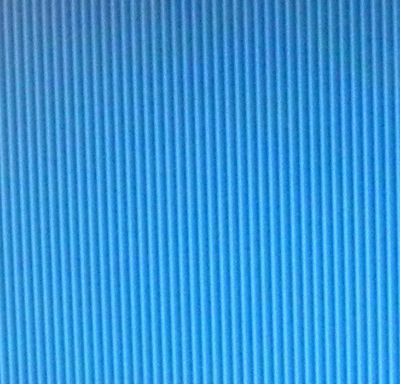 As you can see, Afterburner does not display the exact value of the GPU voltage: there is a difference of around 0.02V (0.031V in the picture). Small difference but for some overclockers it’s important. To overclock the R5770 Hawk, I used the same method I described in this tutorial. 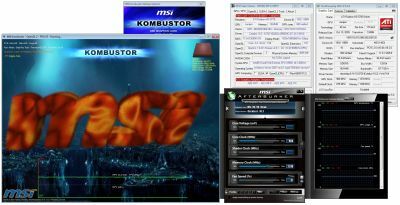 But this time, instead of using FurMark and RivaTuner, I used MSI’s overclocking tools: Afterburner and Kombustor. Afterburner is a customized version of RivaTUner and Kombustor is a customized version of FurMark. You can download Afterburner and Kombustor in the same Zip archive HERE @ MSI. In idle mode, the total power consumption of the system is 100W. 1 – 1024×768, windowed mode, 60 sec, no MSAA. 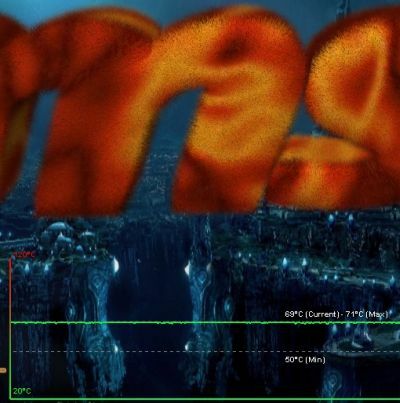 2 – 1920×1080, fullscreen, 60 sec, no MSAA. With default clocks, the total power consumption of the system is 200W (1920×1080 fullscreen). With overcloking settings, the power consumption is 210W (1920×1080 fullscreen). According the TDP database, we are below the TDP of a Radeon HD 5770: 108W. The temperature is stabilized at 69°C which is really nice. And even with overclocked clocks, the temperature doesn’t exceed 69°C. 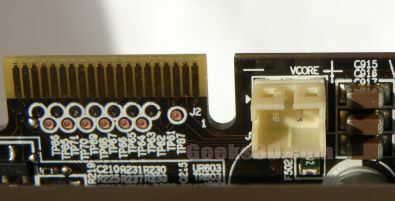 I think this is the hardware VRM monitor that does its job (see HERE for more details). And what about Kombutor scores with these OC settings ? Considering that MSI’s R5770 is already factory overcloked, this is a nice gain in performance. 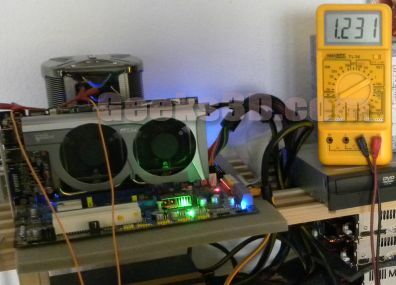 970MHz is the max clock you can have with a GPU voltage of 1.2V. For example, W1zzard (techPowerUp) reached 980MHz with 1.25V, and 1020MHz with 1.35V. Guru3D has reached 1050MHz with 1.3V. But all these settings are depending on the 3D test used to validate the overclocking. Kombustor, like FurMark, is very GPU demanding and is also graphics memory demanding. So with Kombustor is quite hard to reach the same OC settings than TPU or Guru3D. 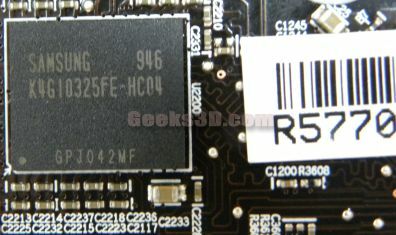 Another factor to take into account is the R5770 Hawk sample. Maybe the sample I have is not the best R5770 sample and its max clocks are limited. to check for invisible artifacts, try occt..
the r5770 works for two weeks within my new system now, and i’ve spent some time to find the ideal overclocking settings. what i didnt know is that ‘my’ timings are that impressive, so some people and this review told me. i am not sure about if i did something wrong while overclocking, maybe you can tell me. i used newest afterburner and kombustor and found no errors. in addition 3dmark06, 3dmarkvantage, unigine 2.0, farcry2 bench and crysis bench went flawless too. 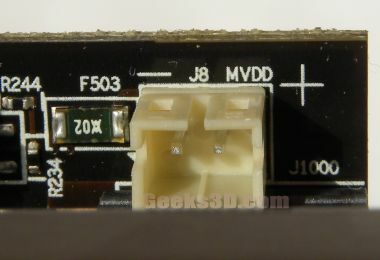 is 1.200V the stock voltage ??? need to check with RBE. I just bought this card and I’m no tech savvy. I don’t know what half of this review is even talking about, all I want to know is what is the best overclocking settings for this card without a big increase in voltage. I have Intel Core 2 Duo 2.8GHz with 2GB RAM (it’s not a gaming computer). What’s the deal with that error you mentioned? 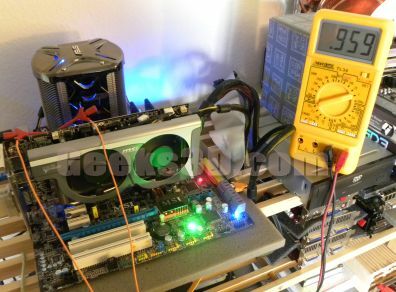 Does that happen if I increase clock speed too much with increasing voltage? I’m too scared to increase the voltage more than 1.2V and even that might be too much. 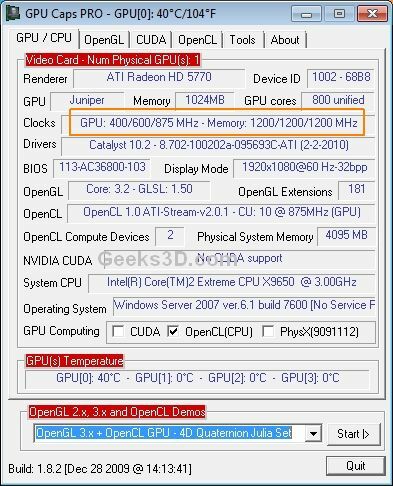 Could someone just give me some stable, light overclocking settings that won’t make the card overheat, my computer have that big error, or run a moderate risk of either of the former. 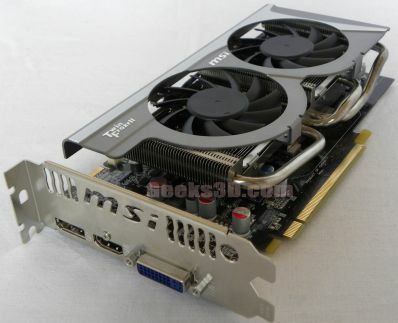 this card is excellent, My old 5770 went up to 85c on kombustor on STOCK SETTINGS! 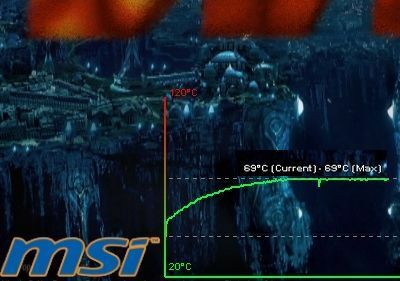 anything BELOW 80c is a good overclock, in my book. I cranked up the voltage to 1325 Ma, i wont go to the meax of 1350, as i never like going max on the voltage. Core clock, ive pushed it to 1040MHz and Mememory clock to 1400 MHz. Thats a 15% increase on the memory and a 22% increase on the clock. All running with a nice stable 74c after 10min on kumbustor, although I do have a fan blowing directly on the card as well. Fan speed is around 70% which is good as well. Well my 5770 HAWK GPU overclocks to 1000MHz with no voltage tweaking (Only when I switch on the air conditioner, but that’s stable).